Your birth certificate has to be without doubt the most important document you will ever have in your possession. This document gives details that any identity thief would find invaluable in their continual quest to defraud honest individuals out of thousands of pounds in money or goods obtained by deception. What Information is on My Birth Certificate? This may not sound particularly useful information to you or I but to an identity fraudster this is these are the building blocks to any campaign of fraud against you. In the hands of a identity thief this information is enough to start the proverbial ball rolling and gives them enough information to start filling out forms either online or in person in order to obtain money or goods by deception. Your birth certificate is one of those documents that you never carry around with you if you don’t have to. There may be occasions when this document is required as proof of identity – and just as you might use it as such so too might an identity fraudster. If your birth certificate is not in use then you should keep it in a safe place at home. Either in a small fire proof safe or fire proof filing cabinet or in a place where only you and your wife or partner have access to it. When Do I Need my Birth Certificate? You will need your birth certificate if you are getting married or when you are applying for such things as a driver’s licence or passport. You may also be called upon to show your birth certificate if you are opening up a bank account or applying for employment through a recruitment agency. If you are asked to send your original birth certificate off as proof of identification for a driver’s licence or passport application find out first of all if the organisations in question will accept a photocopy or scanned copy. Where possible you should avoid sending original documentation through the postal system. Although for the most part sending documentation through the postal service is safe – in particular if it is registered or recorded – sometimes accidents do happen so sending a copy is more a case of damage limitation. Can I Get Another Birth Certificate if I lose mine? Yes you can. 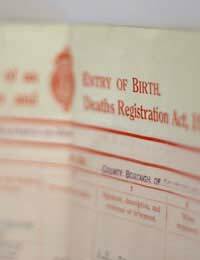 You must contact the registrar of births, deaths and marriages in the town where your birth was registered. There will be a nominal fee incurred but this is a small price to pay for such an important document. You will need to visit the registrar’s office in person and sign some forms as well as showing proof of identification such as a passport or driving licence. This is designed to cut down on the likelihood that an identity fraudster may try to gain a copy of your birth certificate through illegal means. You should consult the registrar at your office of births, deaths and marriages and inquire as to what procedures they have in place for obtaining copies of a birth certificate. My friend went for a job interview and they photocopied her birth certificate, passport and all of her qualification certificates. But they never gave her the job. Should she be worried? I didn't think that they should copy all of these until she was hired? Please help. Yes, it can be a big problem. An identity thief can use your NI number fraudulently to obtain Social Security benefits, welfare benefits, tax refunds and tax credits. It can also be used to gain empoyment in your name. You should report it to the police or Action Fraud Reporting Centre as soon as possible - 0300 123 2040. I was subject to fraud and people now have my national insurance number - is there anything i can do and is it a problem? Spot on kazzi the government should mark the birth record when the person has died so it cannot be used by con men and women simple. this is a complete lie. ANYONE can order a birth certificate for another person simply by filling out an online form and then you can get it. They do not check anything, i know because someone ordered mine without my consent and luckily i found out but the General Register Office said it was completely legal. It seems they want fraud to happen!